edited by Pitman B. Potter and Ljiljana Biukovic. Vancouver, CA: UBC Press, 2011. 320pp. Cloth $90.00. ISBN 9780774819039. Paper, $34.95. ISBN 9780774819046. Reviewed by Erick K’Omolo, Doctoral Candidate, Faculty of Law, The University of Hong Kong, Email: ekomolo [at] hku.hk. The desire for post-world war II institutionalisation of free markets led to the promotion of a global legal order informed by the push to transplant regimes and norms established under multilateral trade agreements into domestic systems of contracting parties. The guiding normative assumption was that because contracting parties have ratified the multilateral agreements, national implementation follows with ease as part of the integration into the multilateral trading system. However, although often less discussed, the process of implementing multilateral trade agreements, (which are often hugely influenced by Western norms of liberalism) into national systems is often wrought with challenges of adaptation as cultural factors come into play. This timely essay collection edited by Potter and Biukovic takes this important debate further by presenting incisive scholarly discussions on the competing interests between liberal norms of capitalism associated with the global North and inherent in multilateral trading agreements, and factors of cultural orientation that dictate level of acceptability in different national systems. Based on the running theme of ‘selective adaptation’, the book presents provocative discussions of how various, largely East Asian, countries have attempted to implement the multilateral trading rules and regulations while exposing the influence of local cultural practices. While the book is divided into three principal sections, the contributors undertake an exposition of the philosophical background of the concept of ‘selective adaptation’ in part one followed by an empirical debate on the contribution of local norms to dispute resolution globally. 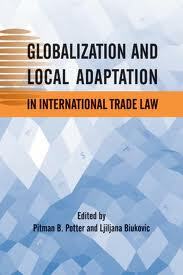 For instance, in the introduction, Potter describes the concept of selective adaptation as “localised responses to external regulatory standards” (p.10) thereby presenting a scenario where norms of trade liberalisation are subjected to domestic circumstances in implementation. Potter argues that the success of the implementation process of external regulations is largely dependent on ‘interpretative communities’ in a country which include civil servants, professional and other socio-economic groups that dominate at the national level and control specialised knowledge relevant to interpreting non-local standards (p.10). In chapter 2, Biukovic uses competition law to demonstrate the unsuccessful efforts toward universalising global trade standards. She argues that fervent resistance because of largely national norms and interests from countries such as China and Malaysia have succeeded in impeding adoption of a global competition law leading to its eventual removal from the agenda of Doha rounds of the WTO. Instead, Biukovic argues that the fact that over 90 countries have indeed adopted competition law in one form or another confirms the dominance of national trade interests over a universal framework as developing countries have different socioeconomic priorities (pp.24-25). To demonstrate these differences in adaptation of competition laws, Biukovic uses the examples of Japanese and Chinese Anti-Monopoly legislation (p.30), which despite their adoption to improve global competitiveness of the respective countries still retained significant local characteristics of state control. Cultural influence in conflict resolution processes is discussed in chapter 3. Specifically, while calling for more open discussion of its role, Buchtel argues that cultural orientation continues to influence behaviour and decisions of mediators in conflict resolution including in the area of trade law (p.39). She discusses empirical examples from China-US WTO disputes and Syria-Israel talks of 1991-2000 where basic cultural differences in meanings of certain words played a role in stalling the resolution of the disputes. Eventually, the chapter innovatively explores possibilities for application of ‘selective adaptation’ methodology whereby local cultural norms are given prominence in dispute resolution (pp.47-50). In my view, this proposal deserves urgent attention if international dispute resolution forums are to become effective in promoting the global trading system. Part two of the book discusses more practical situations of how local norms and cultures have tended to influence application of adopted global legal systems in jurisdictions in East Asia and North America. In his essay on “Globalisation and Local Culture in Contracts,” Yoshitaka Wada presents a comparative survey to show how cultural inclinations that emphasise building of social relations as opposed to pure contractual terms is prevalent in Japanese businesses compared to the Thai system. The essay offers the example of the Japanese motor industry which collectively agreed to pay suppliers in Thailand double price as a mechanism for bailing them out during the 1997 Asian financial crisis. In a nutshell, Wada argues that the tendency of courts to limit their scope in dispute resolution to express terms of the contract without considering social [*372] dimensions may be a barrier to building businesses and calls for necessary reforms. On the other hand, Katherine Richardson in her examination of labour mobility in North America under chapter 16 of NAFTA discusses how different structural and economic priorities across the three member states (Canada, Mexico and the USA) have influenced the achievement of its objective of easy flow of professionals across the borders. Through an empirical and theoretical analysis of implementation of chapter 16, which was originally intended to replace the H-IB visa process and liberalise immigration of professionals in the region, Richardson concludes that this goal is yet to be fully achieved. And even where contraventions of chapter 16 are witnessed, there has been reluctance to lodge disputes by aggrieved parties who prefer informal mechanisms (p.79). While attributing this failure to an array of issues, the influence of national norms and orientation in response to NAFTA chapter 16 is prominent. Thus, according to Richardson, this influence has resulted in Canada adopting proactive policy measures that empowers its border officers to instantly deal with chapter 16 disputes while the USA has increasingly adopted a top-down approach as direct response to 9/11 security measures. Finally, due to its deeper socio-economic challenges and unemployment, Mexico has generally demonstrated less enthusiasm for enforcement of NAFTA chapter 16. Liao Zhigang’s exposition on “The Trips Agreement and New Developments in Intellectual Property Law in China” though inexplicit on the influence of local cultural norms in implementation of TRIPs in China, shows recent administrative developments that China has undertaken from 1980s to accord greater IPRs protection in tandem with global standards. Since in China ratification of a treaty automatically makes it part of domestic law, its accession to the WTO means that the TRIPs Agreement in its entirety is law in China. However, Liao argues that despite much recent progress made through State Council regulations, the country still has some ground to cover to meet international standards in IRPs protection. On the downside, although Liao has appreciably discussed administrative measures taken in China to protect IPRs, he does not present empirical data of IPRs disputes litigated in China. Arguably, this could have offered greater insights on the practical level of enforcement of IPRs protection in the country. While Liao’s essay might have been inexplicit on the influence of local norms in IRPs protection in China, Schwindt and McDaniels’ essay on Japanese competition policy points this out explicitly. In retracing the history of competition policy in Japan to pre-occupation times, the essay successfully highlight how Japan supported cartels through the Zaibatsu policy, which saw privatisation of public enterprises and selling them to selected groups called Zaibatsu. The apparent argument is that Japanese norms regarded the cartelisation policy as a way of protecting public interests by avoiding destructive competition. However, the Schwindt and McDaniels argue that the US occupation of Japan saw dismantling of the policy as the USA’s norms of capitalist liberalism were integrated. Nonetheless, post-occupation Japan saw [*373] gradual re-introduction of laws that supported cartels by Japanese elites thus marking the creeping return of local regulatory norms oriented towards social relations and family businesses. The essay points out that it was only after the catastrophic effects of the 1973 oil shocks partly attributed to cartels that Japanese society turned against them, leading to the introduction of more stringent anti-competition regulations. Combined with the threat of retaliation from the US in the 1980s, Japan eventually abandoned cartels and embraced US-oriented Anti-Monopoly legislation. Overall, Schwindt and McDaniels ably demonstrate how Japan applied ‘selective adaptation’ in the development of its competition law regime as it was only after its society accepted the complementary relevance of US-oriented legislation to Japanese businesses was it able to completely abandon its cartel-led approach. In the final essay of part two, Potter examines the broad spectrum of how ‘selective adaptation’ has been applied in China as it integrates into the global economic and trading system which embodies norms of transparency and autonomy (to the private sector) (pp.181-182). Using the Confucian orientation prevalent in the Chinese society (p.185), he argues that despite its accession to the WTO, strong state-led development is preferred as part of Chinese culture. Potter thus discusses the conflict between the expectations of norms of transparency and autonomy within the world trading legal regime, which emphasise less role for the government, and the state-centric local norms in China which acknowledges the overriding supervisory powers to the central committee of the Communist party. Thus, he rightly urges for more balance in complying with global trading standards that selectively adapt to local concerns. Part three of this collection provides useful insights through case studies of how ‘selective adaption’ has been engaged in dispute resolution within the international trading system. Maomi Iwase’s essay on “International Dispute Resolution in Japan,” for instance, evaluates the development and reforms of different international dispute settlement mechanisms including civil litigation and ADR in Japan. With the original goal of making Japan an international trade dispute settlement centre, the essay argues that Japan took several reforms that encouraged different administrative and judicial mechanisms as forums for dispute settlement. However, from empirical surveys presented, Iwase concludes that Japan is yet to achieve this objective as language barriers and preference for the China International Economic and Trade Arbitration Commission (CIETAC) in the Asian region amongst others weigh-in (p.210). One potential omission in this essay, however, is the failure to clearly articulate how ‘selective adaptation’ contributed either way to the slow progress in utilisation of international dispute settlement in Japan. However, the lacuna is possibly cured by Saegusa and Dierkes’ essay on “Alternative Dispute Resolution in Japanese Legal Education,” which analyses empirically how the education system in Japanese law schools had by 2004 proactively included ADR programmes in their syllabuses (p.250). Assessed retroactively, the voluntary integration of ADR into Japanese training system can be said to be part of efforts to make [*374] the country an international trade dispute settlement centre into the future. The essay, however, concludes that actual impact can only be speculated at the time of writing (p.251). Despite the good reputation of CIETAC, China has equally faced challenges in establishing effective international trade dispute settlement system. Wang Shuliang’s “Introduction to International Trade Dispute Settlement in China” explores this dimension as it analyses the legal framework and judicial structure governing trade dispute settlement in China and attendant reforms to bring it in tandem with global standards. While briefly highlighting alternative dispute settlement mechanisms in China (conciliation, arbitration and mediation), the essay also tackles jurisdictional issues on trade dispute matters across different levels of Chinese Court system. However, considering the much debated concerns about the justice system in China, a more inclusive approach on the selective adaptation application in trade dispute settlement in China should have considered recent jurisprudence as well. Perhaps, Wenwei Guan’s essay gives the best perspective to the dynamic facing selective adaptation theory, as a running theme in this book. In comparatively analysing enforcement of Olympic marks infringement in the US, Canada and China through case law, Guan exposes the competing interests in private-right approach witnessed in US and Canada, and the public/state-centred enforcement in China. This position in China, according to Wenwei, is traceable to Chinese socio-cultural approach which historically regards private intellectual rights as part of the social, thus needing public protection (p.276). In conclusion, Wenwei presents an apt case for ‘normalising’ global norms through local practise predicting that even as China integrates into global trading system, it is unlikely to abandon the central approach of public sector-led enforcement. This is indeed the normative theme of all essays in the collection, and is correctly reinforced by Biukovic in the conclusion when commenting that with respect to international dispute settlement rules ‘...further lawmaking has to be culturally sensitive before trying to be culturally neutral’ (p.293). Needless to say, this collection is an important addition to scholarship on integrating international regime in local national systems. Notwithstanding sporadic absence of case studies and empirical data, it offers practical insights of particular relevance to economically less advanced countries that have long faced the challenge of incessant demands for uniform global enforcement. Copyright 2012 by the author, Erick Komolo.